Oct. 31, 2018 – The Rexroth Sytronix variable-speed pump drives comprise a comprehensive modular system of pumps, controller and motors, as well as software depending on the cycle characteristics and configuration. The variable-speed pump drives can reduce energy consumption in the most varied applications by 30 to 80 per cent. The Sytronix DFEn 5000 variable-speed pump system is a member of this product family. It is based on the proven DFE pressure and flow control system. In combination with a frequency converter, the system provides a dynamic and very economical solution for controlling oil volume and pressure. 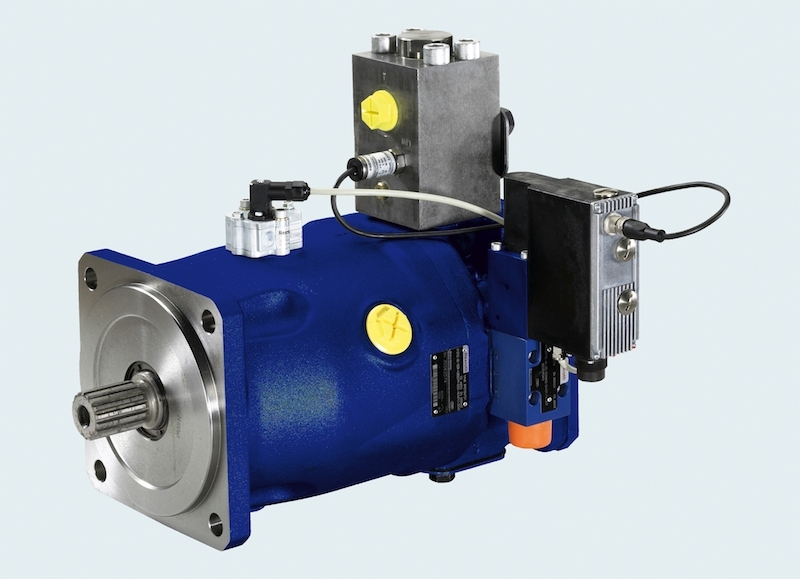 The Sytronix DFEn 5000 closed-loop control system consists of a variable displacement axial piston pump driven by a standard asynchronous motor frequency converter. Digital on-board electronics calculate the optimum speed for the entire drive system. The destroking of the variable displacement pump lowers the flow rate and reduces the engine load. The optimum speed for maintaining pressure is between 300 and 400 one/min depending on the pressure. With machines that work on cyclical basis, a teach-in process can be used to bring the system back up to speed just in time before an increase in flow rate. With non-cyclical machines, a contact can be closed to raise the speed to the required minimum shortly before an increase in flow rate is required, for instance in case of a batch change. That way, the full dynamic of the control pump is available when needed. The control system is available for the pump series A10 and A4, making it suitable for use in a wide range of applications and also retrofittable.